Are you headed into the July 4th weekend excited to party with family and friends, but nervous about endless buffets of food? 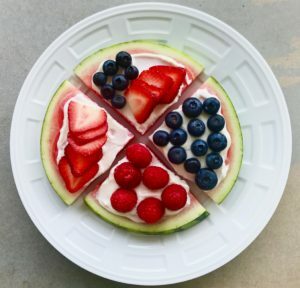 Start with a plan and try these festive yet healthy red, white and blue recipes. In a bowl, stir together greek yogurt and honey until combined. Spread yogurt-honey mixture over watermelon slices. Top with blueberries, raspberries, and strawberries. Feel free to get creative with your toppings! Slice mozzarella into 1/4 inch thick slices. 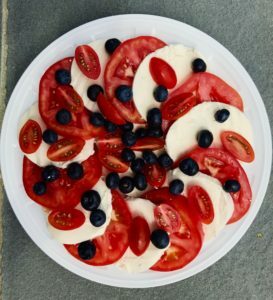 Alternating between the tomatoes and mozzarella, place them in a circle on a plate. Sprinkle with halved cherry tomatoes, and blueberries. Get creative! Sub feta or ricotta cheese for mozzarella, add jicama or blackberries. Drizzle with olive oil to taste.